(Newser) – Deputies went door to door ordering residents to evacuate from coastal Southern California neighborhoods ahead of a powerful winter storm sweeping in Friday after bringing heavy snow and whiteout conditions to northern mountains and steady rain elsewhere. As many as 30,000 people are under evacuation orders in the foothills of Santa Barbara County, which were stripped bare by recent wildfires, the AP reports. Sheriff Bill Brown said forecasters weren't certain how intense the storm would be when it arrives in Southern California in the early hours of Friday. However, modeling indicates "there is risk to life and property and risk of disruption to critical services," he warned. 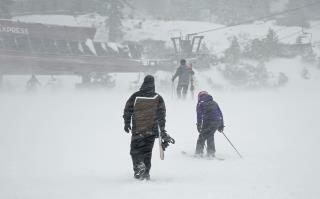 To the north, a blizzard warning was in effect for parts of the Sierra Nevada. Storms in the NE and California make the news because according the New York Times nobody else really exists except to redicule. Next story will be about all those that died after not heeding warnings. The photo with this story is quite misleading. I can assure you that Santa Barbara will not see snow anytime soon.